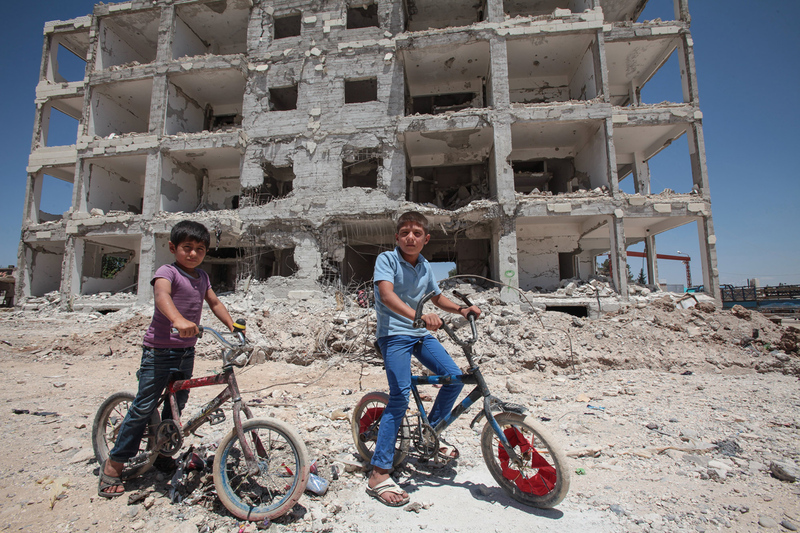 Children pose on their bicycles in front of a destroyed building in the center of the Syrian town of Kobane - Bicivilizados. Ciclismo urbano. Alegría entre tus piernas. Children pose on their bicycles in front of a destroyed building in the center of the Syrian town of Kobane, also known as Ain al-Arab, Syria. on June 20, 2015. Kurdish fighters with the YPG took full control of Kobane and strategic city of Tal Abyad, dealing a major blow to the Islamic State group’s ability to wage war in Syria. Mopping up operations were started to make the town safe for the return of residents from Turkey, after more than a year of ISIS militants holding control of the town.